Don't buy a barstool before reading this guide first! Shopping for barstools is like shopping for clothes – you need to find the right size, fit, and style or you’ll never want to use it. 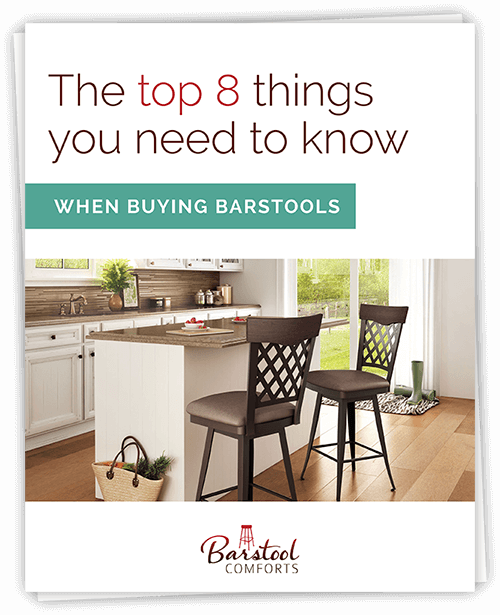 This quick PDF guide shows you how to choose the right barstools for your home or business. Thank you for submitting — please check your email to confirm your email address. "I definitely recommend Barstool Comforts to my friends for their own homes. Thank you again for your help in choosing the metal — the finish is beautiful! I am one extremely satisfied customer!" We’ve run a thriving retail store in Lehigh Valley, Pennsylvania for over 25 years. Along the way, we founded Barstool Comforts to bring you the same quality furniture and personal design advice that we’re known for in our hometown. This PDF is our attempt to pack the best of our knowledge and expertise into a quick, easy guide!